It feels a bit odd to be writing a blog post here because I normally let Kirsty do all the Cato Garden blogging. 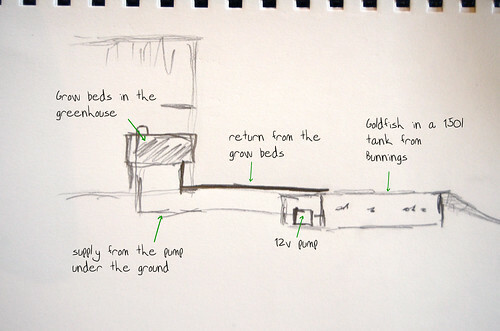 Last winter I started to think about an aquaponics setup. The idea of growing our protein and the tech and science got me interested. But there was something about the complexity of farmed fish in Tasmania which put me off and the idea of more daily work put me off as well. Watching the Urban Permaculture DVD I was inspired again this time in a different way. Focusing first in the idea of having water and fish in the garden and the aesthetics of that. Also instead of trying to grow fish to eat we are going to start with Goldfish. Here is a rough plan of what we are going to do at this stage. The 1st stage is a 150 litre fish pond with Goldfish and a small 50 litre grow bed in the our existing green house under the back stairs. It’s a simple system where the grow bed should drain directly into the pond. We don’t have any outdoor powerpoints so the plan is to run it off 12v. This does make it more complex. Some vertical grow beds against a north facing brick wall. Kirsty is worried we will cook the plants during the summer. Perfect for winter though. 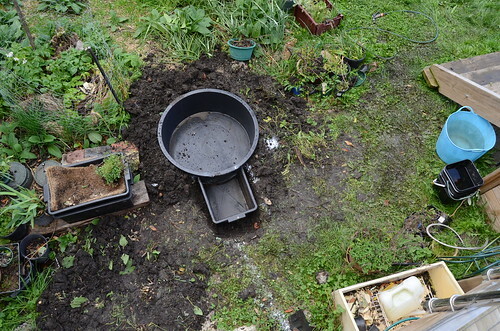 We have already sorted out the bell siphon and Zac has dug the hole for the pond. I’ve cleared Petty St’s workshop of 12v pumps and Dad being a plumber is making this a lot easier and I think he solved about half of the problems. The downside of the 12v pump is they seem to be only able to lift the water about 90cm but that should be OK for us and they only use 1 AMP when they are running. The photos of the building process are under the tag aquaponics and I hope to write about the process as well. 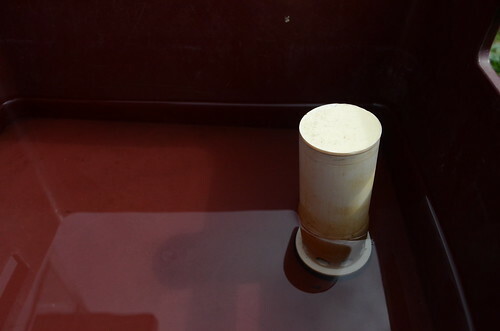 The 1st process post is about the bell siphon.